Delicate and reserved, beautiful and elegant, Korean dance is characterized by breathing movements that emphasize symmetry. 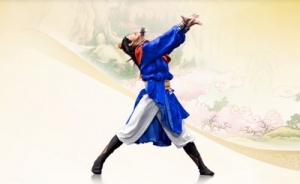 In Shen Yun performances, Korean ethnic dance refers not necessarily to the dance styles found on the Korean peninsula, but to those of the ethnic Korean people who live in northeastern China. Breath is an essential part of Korean dance—the dancer is able to express inner emotions through coordination of breath and musical rhythm. Dancers also pay particular attention to maintaining roundness in both their arm and trunk movements. For example, hua yuan shou is a circular movement started in the forearms, flowing to the wrists and fingertips. In fan tan kang shou, both hands take turns pushing up from the shoulders in parallel. These features give Korean ethnic dance a transcendent and calmingly dignified beauty.